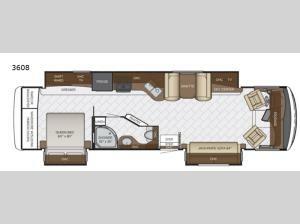 From the full wall slide out to the overhead cabinets throughout this model you will be impressed with the space in this triple slide out 3608 class A Canyon Star motor home. With all of the overhead cabinets and wardrobes you can easily store you belongings that you will need for any trip. In the spacious bathroom there is a 35" x 35" shower as well as a toilet, sink, and linen cabinet. In the evening come sit at the 84" jack-knife sofa while watching TV at the entertainment center.